In the old town of Barcelona you will find the largest concentration of bars, restaurants and pubs. You can eat all day: a cheap breakfast in a bar, a light lunch, a sumptuous dinner or a cocktail at a bar in the evening. 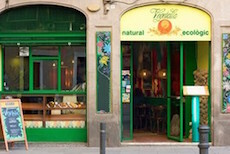 The Raval district is the immigrant neighbourhood, with a very multicultural and tolerant atmosphere. It is the westernmost town district, just to the left of the Ramblas. 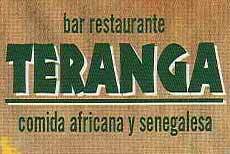 Here you can eat in many restaurants featuring dishes and specialties from the likes of Africa, the Middle East and Asia. 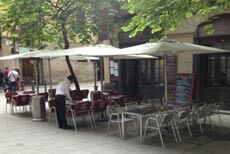 Right on the Ramblas, many restaurants set up to cater for tourists. The staff is mostly multilingual, menu cards are illustrated, and the prices are slightly higher than the restaurants that are just a few metres away. 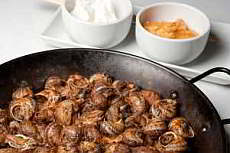 The dishes are often "typically Spanish" - or at least what is sometimes regarded as such. That does not mean that the quality is not so high - on the contrary; there are also several very good restaurants here that are worth a visit. In the Gothic Quarter, the Barri Gòtic, there are traditional restaurants, serving authentic dishes from Catalonia and Spain. Particularly in the southern part - between Plaça Reial and the harbour - a distinct pub culture can be found, where you can go out until late into the night. In the eastern part, right on Via Leietana, is the district of Sant Pere, Santa Caterina i la Ribera. Here, the scene from the Gothic Quarter continues. The cuisine here has a Mediterranean and local influence. 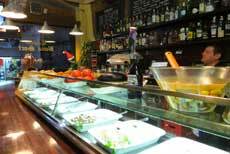 Here, as in the Gothic Quarter, you will also find many tapas bars - a kind of food that continues to enrich the the culinary diversity of Barcelona. Although Tapas originally come from Andalucia, here they get mixed up with international delicacies. Barceloneta is located between the harbour and the sea, the newest district of the Old Town. As this is a former fishing village you will mostly find restaurants with an extensive fish menu. Especially in the warmer months when you can sit outside, the view overlooking the harbour and the sea that many restaurants offer is quite an experience. 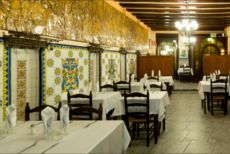 If you are looking for restaurants that have a long tradition and play an important role in the history of Barcelona, you’re in the right place in the centre: e.g. "El Quatre Gats" in the Gothic Quarter, an important centre of Modernism. Picasso had his first exhibition here. 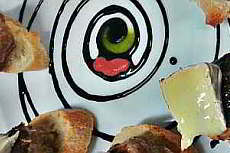 You’ll also find "7 Portes", the oldest restaurant in Barcelona, where Joan Miró regularly dined. Overall, the restaurant and pub culture in the old town is down to earth. Very good food at reasonable prices. 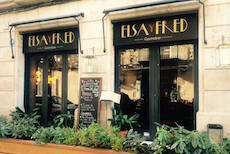 Haute cuisine and restaurants with a Michelin star, can of course be found, but compared to the total number of restaurants fewer than, say, in the Eixample district, or Gràcia. In a little alley in the district El Born you will find this more unusual than classic tapas bar. A creative international cuisine, as well as friendly staff and a comfortable atmosphere are expecting you. The breakfast and the weekend brunch are highly recommended as well. 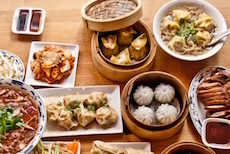 Try out delicious Asian dishes in tapas shape at Mosquito. You can choose from over 20 small oriental delicacies. There are dumplings, fideos, fried vegetables, little meat or fish plates and a lot more. Unfortunately it can get quite full, however the waiting is worth it! 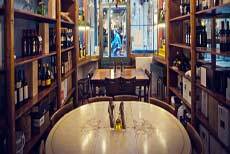 Spacious Bodega with nice atmosphere and a good selection of wines and tapas in El Born. 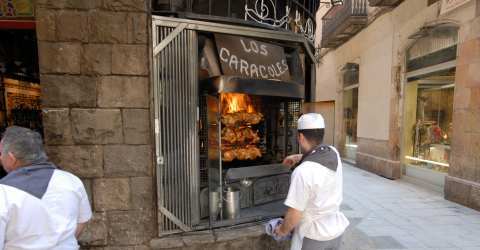 The Can Culleretes is the oldest restaurant in Catalonia and even the second oldest in whole Spain. 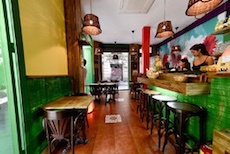 You will experience traditional Catalonian cuisine in a pleasant familiar atmosphere. 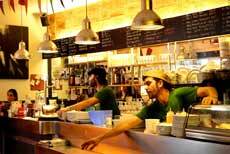 At Hamburguesería Bacoa in Barceloneta you will get delicious burgers made from organic meat or vegetarian. The burger shops of the chain Bacoa are known for the best burgers in the city. At Hamburguesería Bacoa Ferran in the gothic district you will get delicious burgers made from organic meat or vegetarian. 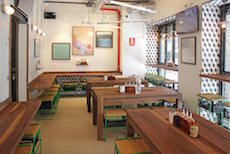 The burger shops of the chain Bacoa are known for the best burgers in the city. At Vegetalia you can enjoy many very delicious vegetarian and vegan dishes. The organic vegetables originate from own growings of the vegetable garden in Montserrat. 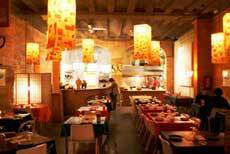 Because of its popularity, there's alreay three Vegetalia restaurants in the old town district of Barcelona. 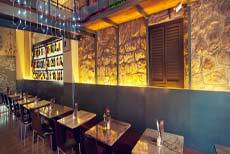 In between arcades and walls of stone, which reflect the charm and the history of the ancient building, the restaurant Bodega Va de Vi welcomes you to enjoy an elegant, familiar and relaxed atmosphere in the heart of the old town district El Born. 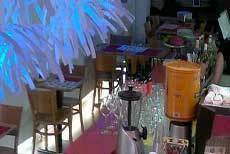 The Colombo restaurant / tapas bar is typical of the Barceloneta district: the furnishing is simple, more value is placed on the meals. 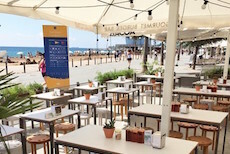 The bar Colombo is located in Barcelona's old port, the Port Vell. At the same time you have a beautiful view of the Montjuïc and the old town. 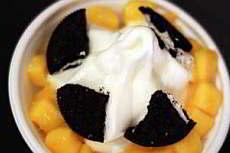 The main product here is frozen yogurt, low-calorie and low fat delicacy. The yogurt is freshly made daily. You can choose from over 20 different "kimök": with fresh cut fruit no preservatives added, cereal, nuts, jam, chocolate, biscuits and much more! 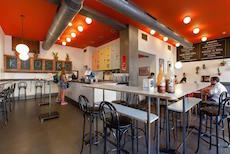 The Candela Raval restaurant offers breakfast, a lunch menu and the bar is open until midnight. Every day the kitchen presents fresh, homemade and unpretentious dishes with a touch of the South. 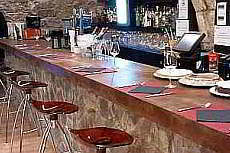 The Candela Raval Expos offer a non-commercial space within the Candela Raval restaurant-bar. Candela supports projects of artists and exhibitions in the Raval district. Since July 2004, this commitment has been coordinated by the graphic designer Gabriel Espí. The La Llavor dels Orígens restaurant is a small restaurant in the historic El Borne district. It has a very familiar atmosphere in a small street, just a few steps from the church of Santa Maria del Mar. Here you can enjoy traditional Catalonian dishes, prepared with ingredients from the region. The Llavor dels Orígins (Borne) restaurant is located in the historic El Borne district. With its location directly across from one of the most beautiful Gothic churches in Barcelona, the restaurant has a special flair. The modern design forms a neat contrast to the winding streets of the Old Town. Here you can enjoy typical Catalan dishes made with local ingredients. 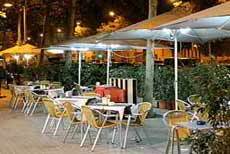 At the El Jardí de l'Angel, you can enjoy Catalan cuisine in a quiet atmosphere, far from the hustle and bustle downtown. Here you can dine in a quiet retreat; the outside area is surrounded by palm trees and colorful plants. 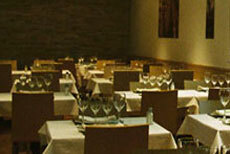 The restaurant is located just two minutes away from Plaça Catalunya. You can reach it through the entrance of the Hotel Catalonia in a former palace built in 1872. Today the house is a part of Barcelona's historic heritage. In Dionisos Born you can experience a culinary journey to the origins of Hellenic Greece. Start your meal with a sweet ouzo, Greek feta, followed by a grilled Souvlaki or a different main course of braised fish or meat dishes. Finally a Greek salad with fresh sun-ripened tomatoes, fresh peppers, cucumbers and fine olives. The history of this restaurant leads us back to the long tradition of fishing in Barceloneta. 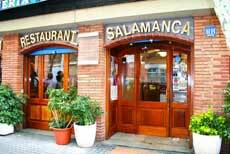 In the Salamanca restaurant the owner Silvestre Sanchez Sierra offers guests freshly prepared seafood, squid, Iberico ham "especially" from Bellota de Salamanca. Meat dishes are prepared from livestock from his own farm. Meals with a fusion of Indian and Mediterranean cuisine are served in friendly, inviting and familiar surroundings. In Indian-Pakistani cuisine you will find dishes of lamb, chicken and vegetarian alternatives such as Okra, Tinda, Palak Saag, Channa Dakl and traditional side dishes such as aromatic basmati rice. The Brasserie du Gothique restaurant is located on the first floor of a house in the Gothic Quarter. This is a place to see traditional gastronomy and service that are committed to creating a peaceful and charming atmosphere. With the Japanese garden, you can also enjoy your meal outdoors. The chefs are masters of traditional French cuisine; they cook a selection of regional specialties, fish and seafood, as well as meat dishes. Fondues are also available here as a typical French specialty food. 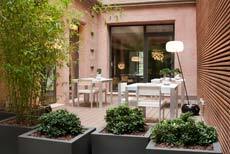 Sensi is located in the historic heart of Barcelona, the Barri Gòtic. 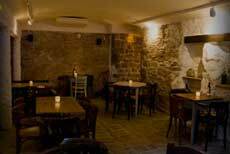 With its stone walls and wooden beams, the restaurant welcomes you with a warm and exceptionally cozy atmosphere. It is the perfect place for a romantic dinner or a nice moment with friends. Sensi offers modern Mediterranean cuisine. The chef combines creativity with fresh produce: the result will tickle your taste buds. Sensi is known for its friendly and professional service. The Tabadu, in the heart of the old Born district is welcoming and friendly, lying just 50 metres from the Picasso Museum. Here you can enjoy Mediterranean food with a wide selection of tapas and small snacks. It is the small bite size snacks start from one Euro: Patatas Brava, Calamari a la Romana, or one of the great classics, the cured Jamón Serrano. At the bar you can enjoy Tabadu cocktails: classics such as Mojito, Margarita and Caiparinha or one of the many cocktails on offer. In Catalan "Casal" means a place of encounter and exchange. 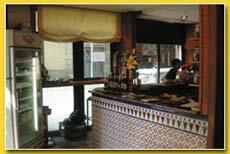 The El Casal is located near the church of Santa Maria del Mar, a quiet place. Enjoy the quiet and relaxing family atmosphere while dining on the terrace. Indulge in typical Catalan sandwiches with premium products, plus a drink of fresh fruit and a cappuccino. At lunch you can enjoy a menu featuring market fresh seasonal ingredients purchased from the nearby Mercat de la Santa Catarina. The chef likes to create new recipes, each according to the season and supply from the market. The style is a combination of Mediterranean cuisine from France, Spain and from Asia. Sun, palm trees and a beach paradise in the Caribbean: enjoy the best cocktails, delicious Caribbean food and Latin music in the heart of the city. And maybe a little dancing. In El Callejón you can enjoy the homemade dishes and a selection of drinks and cocktails in the unique, warm and cozy atmosphere of this Restaurant & Bar. 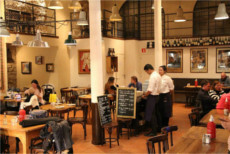 The restaurant is in the heart of Ciutat Vella, the historic centre of Barcelona. 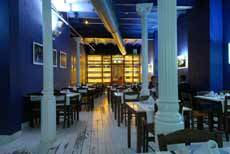 The Fashion Restaurant is located directly on the famous Avinguda del Paral•lel, just one block from the Apolo. Here you can enjoy Mediterranean cuisine, pizza and lots of tasty tapas. At night, the bar offers long drinks and cocktails. 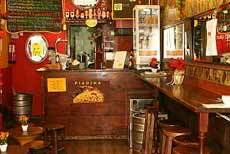 The "Piadina Cicciolina" is a cozy little bar in the heart of Barcelona, where you can enjoy healthy food and drink. The "Piadina" is an Italian pita bread with an olive oil base with pizza toppings. All the ingredients are freshly prepared every day, as is the bread – for which the dough is made according to the original Italian recipe. Even Italians say that the Piadina from "Cicciolina" is better than in Italy. A good red wine goes down well with a Piadina, but a Lambrusco would also be a good choice. The staff is very friendly and helpful. 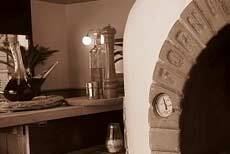 La Pizzaiola is located in the historic old town on the Via Leitana. Above all, here you can enjoy real Italian pizza; featuring a hand-made pizza-base, the finest ingredients and baked in a wood oven. 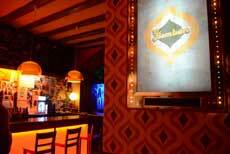 Right in the centre of Barcelona, the Hello Sushi is an explosive mix of Japanese food and club lounge. Live music is also played here. Flexibility in organising a variety of events. 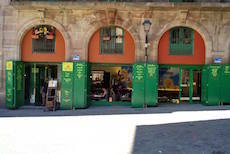 The Bona Sort is located between the church of Santa Maria del Mar and the Palau de la Música Catalana, very near the Mercat de Santa Caterina. Here you will find many charming streets with no cars, and without traffic noise from the main road. 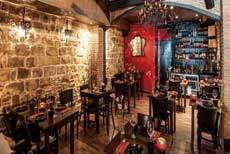 Here is Bona Sort; a mixture of restaurant and tapas bar. Here dishes are be prepared from local Mediterranean food products: Torradas with meats, grilled meats, appetizers and salads and a very good wine list. In the Chardonnay restaurant you will experience an extensive tapas menu: sausage with potatoes, tuna carpaccio, anchovy eggs, shrimp with garlic, vegetable puff with sheep’s cheese and much more. In addition to tapas the menu offers a wide selection of typical Mediterranean meals: salads, carpaccio, rice dishes, and fish and meat dishes. The Baileys truffles and tiramisu of the house are popular ways to finish a meal. In the Gravin Restaurant Giovanni Pepe shows that Italian cuisine has more to offer than pizza: Made with fresh market produce, the menu includes homemade pasta, and many other Italian specialties such as smoked aubergines with tomatoes and onions, served with toasted bread; Tagliolino and hake with lemon; pumpkin gnocchi with Asiago cheese fondue, flavored with white truffle oil; grilled sea bass with artichokes, potatoes and honey and saffron sauce; tenderloin pork with roasted vegetables and ricotta cake with raspberry sauce. You’ll look in vain for pizza on the menu. In a real Italian atmosphere, Giovanni pays homage to his home region in Apulia, called Gravin. 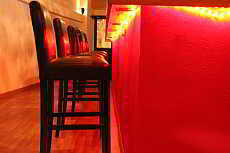 The Gravin Restaurant welcomes you to a warm and peaceful atmosphere with simple but comfortable furnishings. The Nass Restaurant offers Mediterranean cuisine with fresh seasonal ingredients and modern techniques, representing the four seasons. In addition to the Mediterranean variations Chef Rachid Zahi offers a fusion of Arabic and oriental influences. 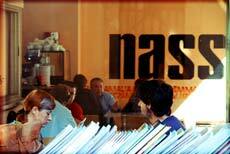 The Nass restaurant serves lunch (€12), dinner (€24) and an à la carte menu. The name of the restaurant is a tribute to the hard work of the "Bastaixos" in building the church of Santa Maria del Mar in the immediate neighborhood. The men carried heavy stones from the mountain of Montjuïc to the site of the gothic church. 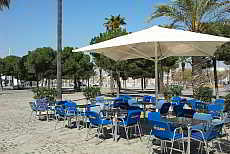 Bastaix is a place to eat and drink, to chat and meet people. Here you can eat popular classic tapas such as chorizo with rum, crusty bread with smoked sardines, onions and tomatoes, beans with Iberico ham, a selection of smoked fish and cheese and much more.